This article discussing another good candidate for a relatively Earth like world orbiting a not to distant star. This week astronomers have announced the existence of a planet discovered to be in human livable range of star not unlike our sun, with a size 2.4 times that of our Earth and a temperature of approximately 22 degrees celsius. This is the most recent in a line of possibilities for habitable planets in the realm of possibility as outlined by an international team of scientists in a paper by the name of “A Two-Tiered Approach to Assessing the Habitability of Exoplanets” as found at Mary Ann Libert Inc, publishing — these scientists are not the same group that’ve discovered this newest planet, but they’re sure to add the new finding to their list sooner than later. 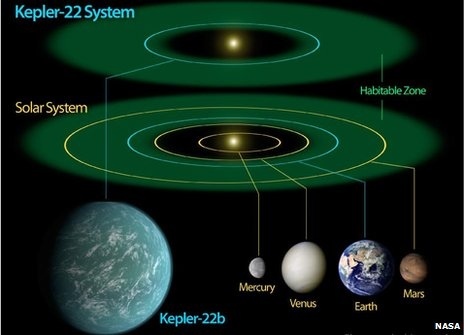 What we’ve got here is Kepler 22-b, a body that is what the Kepler space telescope team says is the closest we’ve ever gotten to discovering a planet that’s like our own – an “Earth 2.0,” if you will. G the gravity constant, being a constant would indicate that your average 150lb person (on Earth) is going to tip the scales at 300lbs. This seems in the realm of supportable but it’ll be a chiropractor’s paradise. Also would have to wonder about atmospheric density and depth, seems like there would be all sorts of interesting knock on effects. This entry was posted in Space and tagged Exo planet, Space by Sci Fi Engineer. Bookmark the permalink.